TwitPic lets you share photos on Twitter. TwitPic Uploader is a specifically designed minimal iPhone/iPod Touch app to upload images to TwitPic and optionally share them via Twitter. This is where you end your photo uploading needs with your friends and followers! In essence, the app will let you upload photos directly from your Photo Albums or from iPhone’s Camera to TwitPic.com’s upload service. It’ll then present options to either copy image URL for sharing with others or opening it in Safari browser or seamlessly continuing with using the app. If the image being uploaded is too large, it’ll automatically to prompt to use a resized variant or original image itself. You can also attach a comment to the photo, which forms the body for your Twitter post (Tweet). The link to the image is automatically included in the Tweet. e.g. “it works! http://twitpic.com/3le5t”. – iOS 4.0 and iPhone 4 support. – Continue uploading while the app is in background. (iPhone 3GS, iPod Touch 3rd gen. with iOS 4 and iPhone 4 only). – Multiple accounts (under landscape mode). – Twitter OAuth and TwitPic OAuth Echo support. – Does not store the twitter login password anymore. – Settings within the app (under Accounts). – No more enforced 115 max characters in Tweet. – Automatic Tweet truncating to max available tweet length. – Better low memory situation handling. – Better image optimization handling. 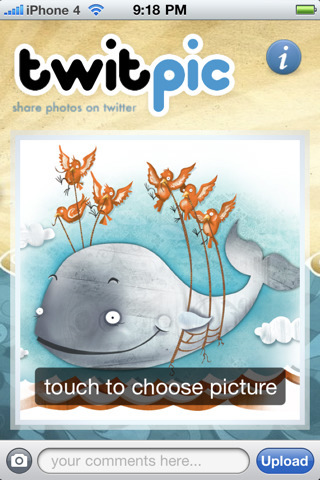 To configure the app features (Twitter accounts, Picture Cropping, Image optimization, etc. ), change the phone to landscape orientation and tap the “Accounts” button. Follow http://twitter.com/Gurpartap for support and updates. Email me (see support) if you have any problem using the app.